Topics: Directions, Moulding, Mounts, Conservation Framing, Mouting Methods, and Box Framing. 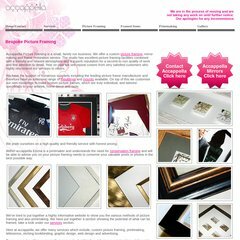 accappellastudio.co.uk Picture Framing In Kent, offering custom picture framing. Wickedly Fast Uk Isp (England, Essex) is the location of the Microsoft-IIS/7 server. The programming language environment is ASP.NET. Its 2 nameservers are ns1.titaninternet.co.uk, and ns2.titaninternet.co.uk. PING www. (85.232.44.164) 56(84) bytes of data.